So here’s a lovely tidbit to share: AlphaOops: The Day Z Went First was mentioned in the Chicago Post-Tribune earlier this week. Can you believe it originally came out SEVEN YEARS AGO? Crazy, I know, because we are not that old. Letters. Words. Stories. It’s a building process that begins with the letters of the alphabet. I wonder who invented them. Who decided the order? Why does A come first? 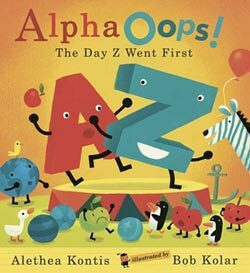 In “Alpha Oops!” Alethea Kontis shows us what happens when Z asks the same question. In this book subtitled “The Day Z Went First” we find the answer. This entry was written by Princess Alethea and posted on January 31, 2013 at 8:27 am and filed under Books. Bookmark the permalink. Follow any comments here with the RSS feed for this post.